What are the symptoms in connection with rhizarthrosis that typically lead a patient to see a doctor? Does the carpometacarpal osteoarthritis always come with pain? Which alterations can be seen on an x-ray image? Which other examinations are required or are advisable? What is the explanation for an unsuspicious x-ray image while at the same time all typical symptoms of carpometacarpal osteoarthritis are being experienced? What is the course of this condition of the thumb saddle joint? 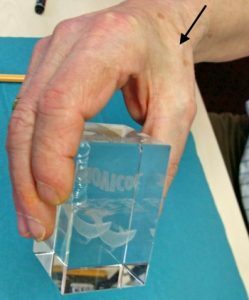 Does a magnetic resonance tomography (MRT) or a computer tomography (CT) of the hand make sense in case of carpometacarpal osteoarthritis? Could a different condition cause the same symptoms as carpometacarpal osteoarthritis? In the early stage of the condition the thumb increasingly loses strength. Patients for example are no longer able to open a bottle. They find it difficult to twist open a doorknob. Lifting up objects becomes more and more challenging. Even extensive writing may cause discomfort. Later on pain develops in the thumb saddle joint as well as the entire adjacent area. In the early phase of the osteoarthritis the symptoms mostly show up under strain. In severe cases the pain will even persist at rest. (Occasionally the pain only starts at nighttime after straining activities were performed, sometimes even days later!). Often even simply bumping the thumb during sleep or lying on the affected hand will inflict pain. There are individuals who despite showing severe signs of osteoarthritis on an x-ray don´t suffer any pain at all! In these cases the thumb saddle joint is likely not flexible or disposes of very limited flexibility. Advanced carpometacarpal osteoarthritis which is visible on the outside. In most cases the area of the thumb saddle joint is swollen and responds to pressure with pain. The image on the left shows an advanced rhizarthrosis. The visible deformity and swelling allows for easy detection of the osteoarthritis in the thumb joint. The most reliable examination method however is the x-ray image. The x-ray image shows the narrowed joint line. 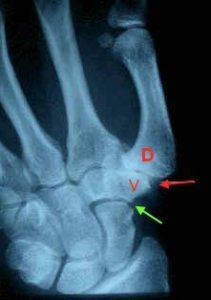 It depicts a thumb saddle joint (between letters D and V). The red arrow points to the nearly vanished joint line. In comparison the green arrow points to a well-visible healthy joint area. 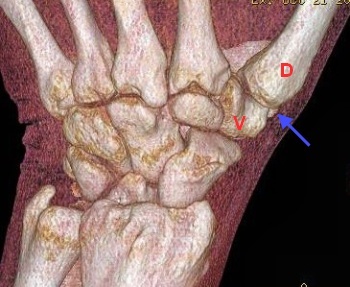 (Seen here is the area between the scaphoid and two further carpal bones). For a better understanding: The cartilage cannot be visualized in an x-ray image. There, where there is sufficient cartilage, the x-ray image will show a well-visible joint line. Areas that are lacking cartilage (if stricken with osteoarthritis) have a much narrower joint line! In case of justified suspicion a lab analysis may be required in order to exclude chronic polyarthritis. Rheumatory arthritis (= chronic polyarthritis) in 80% of the cases can be traced by a rheumatoid factor in the blood. Patients who report frequent numbing or pain during nighttime in addition should consult a neurologist as the carpometacarpal osteoarthritis often comes alongside with carpal tunnel syndrome! This is actually possible in the early stage of the condition. In a case like that the cartilage between the articular surfaces is still intact. In these cases an x-ray image of the thumb saddle joint under strain may show how the thumb moves towards the trapezium bone. In addition a magnetic resonance tomography (MRT) will allow identifying arthrotic alterations in an early stage, something x-ray imaging cannot accomplish. In an advanced stage stiffness and dislocation of the thumb saddle joint will likely occur. As a consequence the neighboring thumb basal joint (this is the joint “in front of” [thus further away from the body] the thumb saddle joint) becomes increasingly overstretched. Therefore the primarily healthy thumb saddle joint may be forced to severe overstretching (hyperextension deformity) as a result of rhizarthrosis. In most cases a computer tomography or magnetic resonance tomography are not necessary in order to reliably diagnose carpometacarpal osteoarthritis. Only in case of uncertainty or if a tumor is suspected in the area of the thumb saddle joint or also if there is a facture that cannot be visualized properly in an x-ray image, the use of a MRT or CT examination may be required. The image shows a CT of the thumb saddle joint in fascinating resolution. However please note: this form of imaging examination represents a much larger radiation exposure to the patient than a regular x-ray image. A “common” rhizarthrosis would not justify such approach. There are extensor tendons running in a tunnel (first extensor tendon compartment) about 2 cm away from the thumb saddle joint. 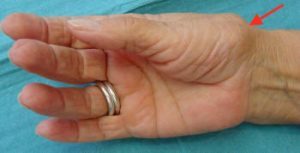 If this tunnel becomes too narrow – your physician will refer to this condition as De Quervain tenosynovitis – pain radiating into the thumb saddle joint area may occur. If the x-ray image shows no osteoarthritis of the thumb saddle joint, the distinction is simple. It becomes more difficult in those cases where an osteoarthritis displaying no symptoms exists along with a painful De Quervain tenosynovitis. If the examining physician applies pressure onto the thumb saddle joint by using one of his thumbs while pressing onto the first extensor tendon compartment with his other thumb, the patient will be able to locate the precise area of his pain.